Welcome to the Free Galleon NTP server checker. 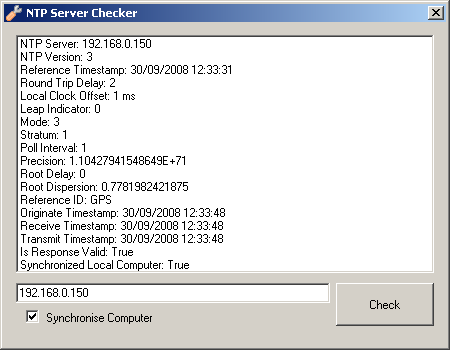 NTP Server Checker software is a test tool that acts as a client to a NTP server. The Galleon SNTP client reports on the responses it receives and allows you to check the accuracy and precision of a NTP time server. You can specify how many requests to send and how large the time between each. The SNTP server checker is easy to use and can test the accuracy and reliability of any NTP server. NTP Server Checker is a test tool that acts as a client to a NTP server. Qweas is providing links to NTP Server Checker 1.0 as a courtesy, and makes no representations regarding NTP Server Checker or any other applications or any information related thereto. Any questions, complaints or claims regarding this application NTP Server Checker 1.0 must be directed to the appropriate software vendor. You may click the publisher link of NTP Server Checker on the top of this page to get more details about the vendor.